A mix of clouds and sun. High 59F. Winds W at 10 to 15 mph..
Seven-year-old Owen McCaughey shows the monitor and delivery system used to control his Type 1 diabetes with his mother, Susan. 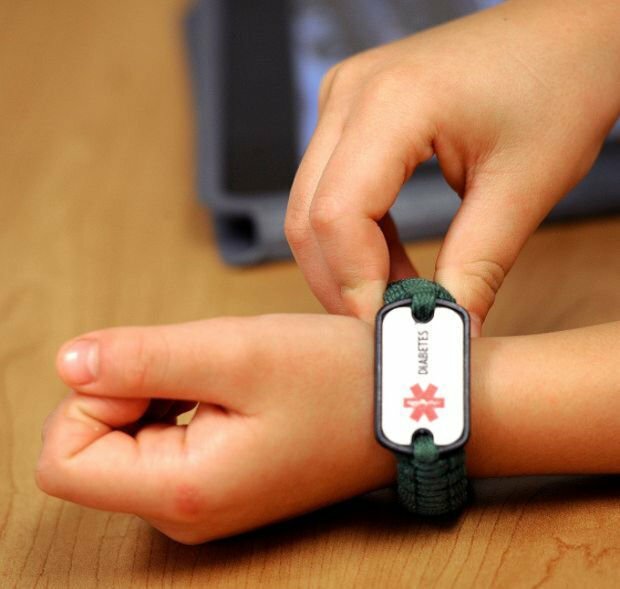 Seven-year-old Owen McCaughey wears a medical bracelet stating he has diabetes. Susan McCaughey can monitor her son’s blood sugar levels from home with advanced technology. BILLINGS -- Kindergarten can be intimidating to a 5-year-old, but when Owen McCaughey started to have accidents and was scurrying to the bathroom every 15 minutes, his mother took note. The frequent urination, excessive thirst, crabbiness and sweet night breath all spelled trouble. Never did Susan McCaughey, mother of three children, suspect Type 1 diabetes. She was convinced the doctors had made a mistake. How could this happen? Her husband, John, was a professional powerlifter; no one in her family has diabetes. Diabetes is one of the most common chronic diseases among children in the United States, according to the Centers for Disease Control and Prevention. Type 1 diabetes develops when the body’s immune system destroys pancreatic cells that make the hormone insulin that regulates blood sugar. It normally strikes children and young adults, but it can occur at any age. People with Type 1 diabetes must have daily insulin injections or be on an insulin pump to survive. In 2008-09, the most current year for which data was available, an estimated 18,436 youth were diagnosed with Type 1 diabetes, according to the American Diabetes Association. Owen wears a glucose monitor made by Dexcom Inc. It measures his blood sugar every five minutes and displays it on a nearby hand-held receiver the size of a pager, which helps monitor his blood sugar for spikes and potentially deadly drops. But it can’t transmit his data to the Internet, which meant his parents couldn’t let Owen too far out of sight, much less stay overnight to a friend’s house, for fear he could slip into a coma. She worried about him at school, too. That’s where NightScout, a homemade system created by software engineers, many with diabetic children, comes in. The system essentially hacks the Dexcom device and uploads its data to the Internet, which lets Susan see Owen’s blood-sugar levels on her Pebble smart watch wherever she is. “When you’re watching this, it’s pretty damn freaky,” Susan said. While she places a great deal of faith in the system, she acknowledges that like with any technology, it isn’t perfect. It has not been approved by the Food and Drug Administration. “We need this technology to keep our kids safe,” Susan said. When the McCaugheys moved to Billings from Texas in May, they sought the medical help of Dr. Sharon Zemel, a pediatric endocrinologist at St. Vincent Healthcare. She declined to comment specifically on NightScout. Susan said she and her husband are just happy to have a doctor who cares. Southwest Montana Auto Guide - Spring 2018 - Your Guide to Cars, Trucks, SUVs, ATVs, Boats, Equipment, etc.